We spend more time working than doing anything else in life. It’s not right that the experience of work should be so demotivating and dehumanizing. This insight is the heart of WORK RULES!, a compelling and surprisingly playful manifesto with the potential to change how we work and live. Drawing on behavioral economics and human psychology, Bock provides teaching examples from a range of industries. He also reveals why Google is consistently rated one of the best places to work, sharing counterintuitive principles that are easy to put into action. WORK RULES! shows how to strike a balance between creativity and structure, leading to success you can measure in quality of life as well as market share. Read it to build a better company from within rather than from above; read it to reawaken the joy in what you do. A dazzling revelation: at once an all-access backstage pass to one of the smartest organizations on the planet, and also an immensely useful blueprint for creating a culture of creativity. It should be given to...every human being who wants to understand how to build a successful, cohesive, high-performing workplace. Laszlo Bock...topples pillar after pillar of conventional wisdom on hiring, training, assessing, and compensating the people who power your organization. If you're looking for forehead-smacking insights along with an array of savvy new practices, WORK RULES! is an essential read. WORK RULES! offers a bold, inspiring, and actionable vision that will transform the future of work. It should be mandatory reading for everyone who leads, manages, or has a job. WORK RULES! is spectacular. I spent weeks with it, because I wanted to take such careful, detailed notes. I plan to share it with our entire Quiet Revolution team – and I'm sure that all company founders will do the same. WORK RULES! is an exceptional book aimed at any manager who wants great ideas for encouraging success from their team . . . an instant classic for the management shelf. 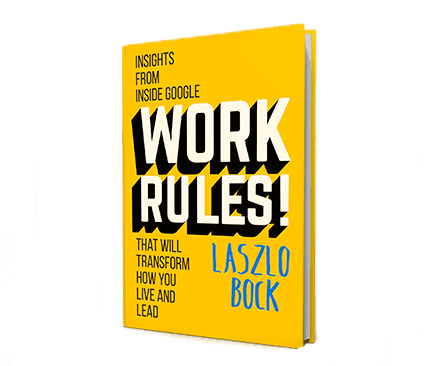 With a clear-eyed, data-driven look into today's workplace, Bock reveals the non-traditional practices that can fundamentally transform businesses of all kinds. The finest book on organizational culture that I have ever read. WORK RULES! is the essential playbook for creating high-performance cultures that liberate people to do their most important work. WORK RULES! is more than a must-read business book. It's a handbook for high-performance teams that win. WORK RULES! is a surprising, unconventional book that is required reading for anyone looking for a job in the tech sector, and for every entrepreneur seeking new modes of innovative thinking. A riveting ringside view of people operations at Google. A deft marriage of research and practice that is full of practical tips. It is an indispensable book for all people managers. As a company renowned for questioning our assumptions, it should be no surprise that Google has developed unique and profoundly effective approaches to culture, talent and leadership. By debunking many accepted HR practices, WORK RULES! establishes itself as a new testament for managing talent in modern times. Clearly written, evidence-based, with practical guidance and a cogent underlying philosophy, WORK RULES! needs to rule the world of work. Jeffrey Pfeffer author of Leadership B.S. Laszlo Bock is Google’s Senior Vice President of People Operations, responsible for attracting, developing, retaining and delighting “Googlers.” Bock’s earlier experience spans executive roles at the General Electric Company, management consulting at McKinsey & Company, start-ups, non-profits, and acting. During Bock’s tenure, Google has been named the Best Company to Work for more than 30 times around the world and received over 100 awards as an employer of choice. In 2010, he was named “Human Resources Executive of the Year” by HR Executive Magazine. He owns a lot of comic books. A lot. Everyone loves focusing on the top performers. The bottom need just as much attention. Most struggling employees aren't bad people, and want to get better. Invest in them. Help them build the skills they need to become stronger. Even if they only end up average, you’ll get a large boost in overall productivity. Going from #9 out of 10 to #5 out of 10 is a huge change. There’s so much we can all do to make work a better experience, and I’m excited to share a few tips in my keynote at #Atmosphere15, a +Google for Work digital event. I’ll cover advice on how to bring together teams of different generations and with different work styles, provide insights from high-performing managers on how to create happy, engaged workers, and much more. Soliciting referrals from employees is a useful tool, and one we leaned on heavily in Google's early days. But most people only have a few referrals top of mind, reducing a potential torrent of candidates to a trickle. It can be scary to be transparent, but the benefits make it worth it. In fact, just by sharing information, results improve. When New York state started requiring hospitals to post death rates from coronary bypass surgery, those rates fell by 41% over four years. Just by making performance transparent, patients received better outcomes. What’s more clever than a good brainteaser? Letting people show their skills and accomplishments. The best interview questions aren’t clever at all. “Tell me about a time your behavior had a positive impact on your team” and “Tell me about a time you had difficulty working with someone” are a few of my favorites. They may be bland, but if you use them consistently they make it easy to separate superb candidates from the rest since the best people have such better examples to share. What are some of your favorite questions? Summer is nearly here, which for many of us means it’s almost intern season! If you’re expecting an intern or any other new hire for that matter, and wondering how best to welcome them, we’ve found five things that make a big difference on how successful new folks are. How big? When we shared this advice with managers, those who followed it saw their new hires become effective 25% faster than their peers, saving a full month of learning time. So hang onto this as a reminder and share it with anyone who’ll be managing someone new. I guarantee they’ll appreciate it! One of the best ways to demonstrate trust in your employees is through transparency. After all, if you believe people are good, you shouldn’t be afraid to share information with them. At Google, everything from product roadmaps to launch plans are visible to employees via our intranet. Likewise, almost our entire code base is available to engineers from their first day at work. This openness keeps everyone informed of what’s going on, reducing redundant work and empowering people to be effective guardians of the company’s core values. Everyone would like their work to be meaningful, but not all jobs make that possible, right? Turns out, it’s all in how you think about it. By connecting your work to how it benefits others, you can find meaning in just about anything. A prime example is Chhapte Sherpa Pinasha, a former Everest guide who now works in a New York deli. According to Pinasha, “the two jobs are not really different,” since “both involve helping people.” Instead of seeing his job as merely slicing lox, he’s found the deeper meaning in what he does, motivating him to do his best work. No matter what you do, there’s someone benefitting from it. Figure out who and use them as inspiration. My 10-minute keynote from Google's Education on Air Hangout last week starts at 2:36:15. 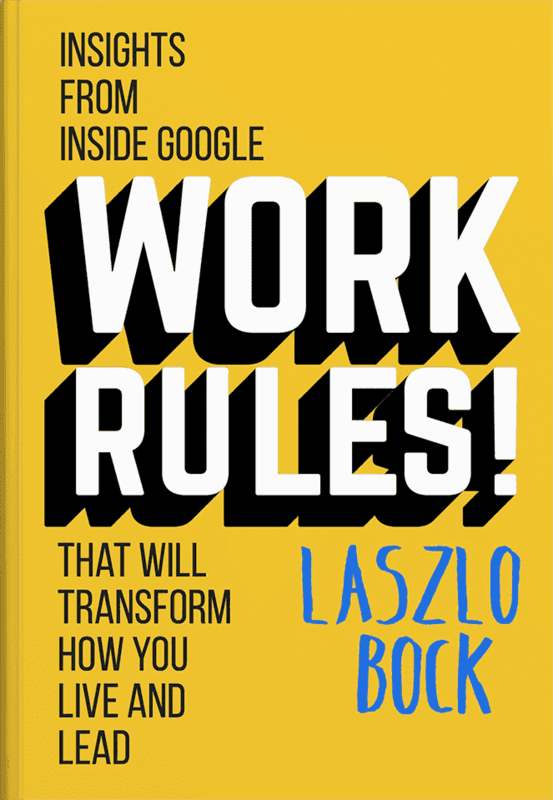 Some thoughts on how what we've learned at Google and in writing "Work Rules!" can apply to education. Since I first started working, I’ve amassed a random walk of jobs that can best be described as a guidance counselor’s nightmare. Yet in too many of them, the one constant seemed to be that people weren’t being treated the way they deserved to be. In fact, for most people, work was just a means to an end, or worse, a downright miserable experience. We spend more time working than doing anything else in the world. It’s not right that the experience of work, even at some of the best employers, should be so demotivating and dehumanizing. "Work Rules!" is my attempt to make things better. By sharing experiences from companies that have been successful by putting their people first and the academic research that backs up this approach, my hope is to arm you with the tools you need to improve work everywhere. Interviews should be challenging, but never brutal. Candidates are evaluating you as much as you are them, so it’s important to treat them well. Simple things like office tours and saving time for questions in interviews show people they're valued, regardless of whether they get the job. Wondering how to nail your next interview? The secret to providing great perks for your people at low or even no cost? How about the craziest things people have done to try to get a job at Google? I wrote "Work Rules!" because I believe everyone deserves meaningful work and that there are tangible things we can do to help get there. Of course, one book can only ever be part of the solution, and there are lots of great organizations already tackling this in different ways. To support them, I’ve decided to donate my proceeds from "Work Rules!" to nonprofits either directly focused on improving work or on improving children’s access to education. Anecdotes about Google’s founding and history mingle with discussions of management theory, psychology, and behavioral economics to create a fascinating and accessible read. An intriguing profile of an innovative company that continues to shake up the world. Billed as Lean In for every manager, this is good guidance from the head of Google’s innovative People Operations, who wants to show companies how to attract and keep the best managers. A compelling and relentlessly useful guide to how Google selects, evaluates, motivates, and keeps learning from its people. For media inquiries, please contact Paul Samuelson from Twelve Books. Download the official media kit.